I don't know what it is about this time of year, but people in the capital are definitely more frazzled than usual - the streets, stations, and trains are more packed than ever; the weather has that ambiguous seasonal mix that spells 'blah'; and the Parisian disposition seems to be especially ornery - or maybe it's just me. Anyway, as a fellow diner at Le Gaigne astutely observed around the end of another exceptionally satisfying meal at that venue, 'You're lucky to be living here!' 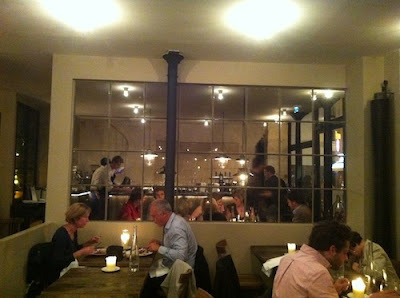 And after back-to-back weekends of excellent dinners at Septime and the aforementioned Le Gaigne, I would have to agree. 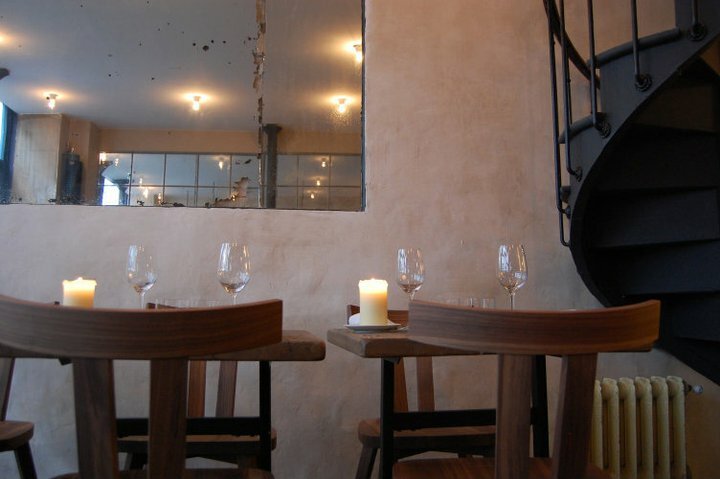 As I've already done my due diligence regarding Le Gaigne, I turn my focus in this installment on Septime, another one of those hot bistrots of the moment that many have been raving about. And when that happens, my warning antennae start signaling caution. 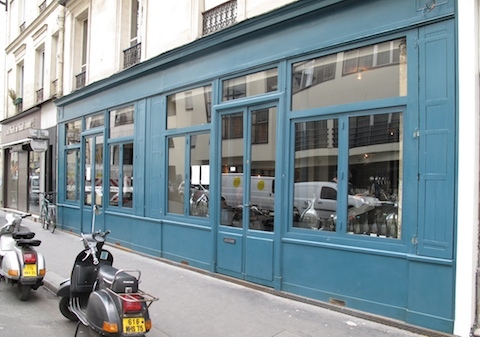 I've been to enough over-hyped, over-priced bistrots in Paris to know that the raves often can result in a significant letdown - good, but not good enough. In fact, among the many raves for Septime are more than a few 'disappointed/decu' customer comments, and I must admit, I wasn't expecting much. Yet, as this review's title suggests, this time I settled for better than expected. Other than my personal gripe at not having a mise-en-bouche, the meal was thoroughly satisfying from the opening entree to the understated, yet epic, dessert. 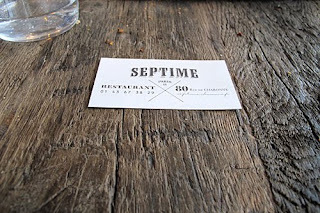 Septime is a venue that I took a quick liking to as soon as Co. and I were guided into the far dining room, which sported that uncanny combination of unfinished/ modern, with a rustic far wall sporting a long horizontal mirror, an iron spiral staircase, potted plants embellishing the large storefront window looking out on rue de Charonne, and a young, upbeat and friendly waitstaff. 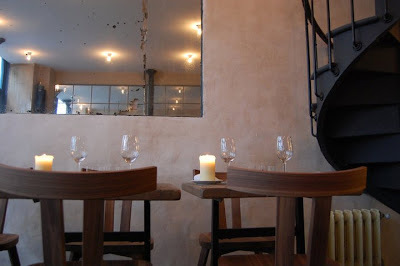 Yes, we eased into our wooden butcher block square of a table and were quickly handed a little clipboard on which a sparse carte of offerings was attached. 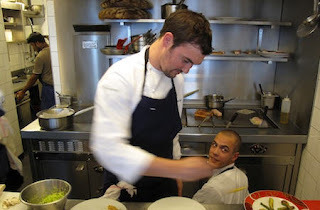 This was a no-brainer, a 5-course 55€ 'menu' consisting of a sampling of items from the a la carte offerings selected by 30-year-old chef Bertrand Grebaut. A basket of mouth-watering country bread (did I just say 'mouth-watering'?) arrived at the table shortly before our 35€ Pinot Noir Binner. I love good bread and here there was no complaint. This is where my review breaks down - blame it too much Pinot, blame it on interference from my dinner at Le Gaigne last night, blame it on the Macarena - but details as to our particular dishes are lacking in my memory networks. I took some photos, but they really don't do justice to the dishes, so I've just added a couple from other sites. Here's what I can tell you: the meal got off to an interesting start with a light combination of delicate scallops with cresson. This was a subtle dish whose pleasures slowly snuck up on me. It wasn't the highlight of the meal by any means, but a sign that chef Grebaut has a talent for bringing forth flavors without overcomplicating a meal. Let's just say elegantly simple. 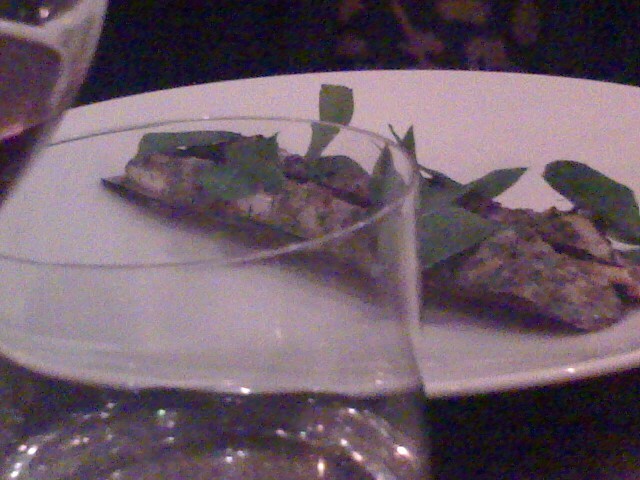 The opener was followed by couteaux and beurres des herbes arrayed in a long narrow shell. 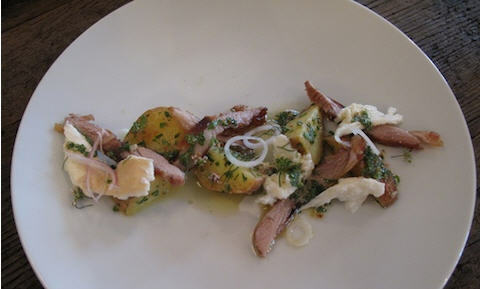 This dish was perfumed and tasty (what the hell, here's my photo. Next up was a rouget dish accompanied by topinambour--the Jerusalem artichoke has made its way to every Parisian kitchen on the planet--and cabbage, another home run. Next, poulette de patis/racines - if you're thinking there isn't much you can do with chicken that hasn't already been done, you should have tried this. Not exceptionally creative, yet the meat was succulent and plentiful. Yes, when I say plentiful, it was nice to have a tasting menu for a change that consisted of more than microscopic dishes. 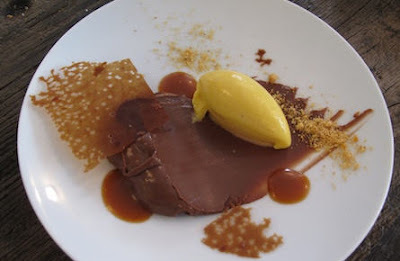 All I can remember about the dessert - maybe it was the pinot afterall - is that when I saw the little block of chocolate and mango accompaniment, my first words to Co. were along the lines of 'not very interesting.' Wrong. 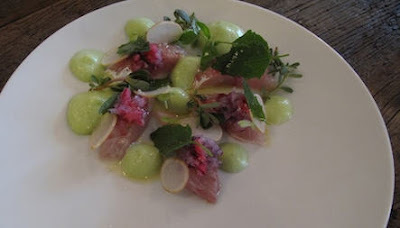 This was one of those dishes that starts out slow and quickly builds to a crescendo. By the end, I noticed that both Co. and I were still scraping the plate with our spoons to get that last drop. That's always a good sign. I wish I could relate more about the specific plates, but this is another one of those places with rapidly changing menus - no complaint, change is a good thing, of course. 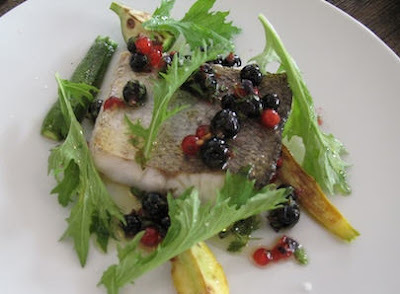 But in the wake of Le Gaigne's killer dinner last night, it's kind of difficult to think of anything but. 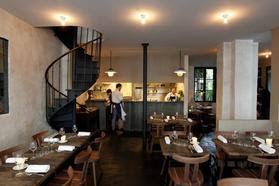 Nonetheless, Septime reminded me more than a little of Le Chateaubriand, one of my favorites, so I'm looking forward to a return visit. Why 'Septime'? Check out this video link. The film was Le Grand Restaurant, and the character played by Louis de Funès aspired to open a 'great restaurant' called Septime. Monsieur Grebaut is obviously a film buff, and in his case, life imitates art. Beyond Paris Restaurants Blog - Shopping, Etc.